The recent unusually wet winter promises an abundance of flowers this year: especially great news for the cheery blackfoot daisy which has one of the longest blooming periods of any of our native wildflowers. Also known as the plains blackfoot or sometimes rock daisy, this plant favors rocky soil in dry hills and canyons and pops up in a variety of open spaces throughout the Preserve. A member of the daisy, or composite family (Asteraceae), its genus name, Melampodium, means black foot from the Greek words mela, black, and podion, foot. Melampodium leucanthum is one of three native blackfoot species in New Mexico and the only one I have found thus far on the Preserve. Leucanthum describes the flowers from the Greek leukos meaning white and anthos meaning flower. Blackfoot daisy is a low growing perennial that tends to form round, bushy plants rarely more than a foot high and sometimes up to two feet wide. The stems may be reddish in color and become woody at the base of the plant. Leaves are straplike in shape with smooth edges, less than a quarter inch wide and up to two inches long. They are arranged in an opposite pattern on the stem and are covered with stiff hairs lying flat on the surface of the leaf. The effect of the hairs is to give the plant’s herbage a grayish color. Plants are typically covered with honey-scented white flowers all summer and into the fall. Single flowers about one inch in diameter occur at the ends of hairless stalks up to four inches long. As a member of the daisy family (remember golden crownbeard and tansy aster), the flowers we recognize are actually “composites” of many individual flowers tightly clustered into a single head. 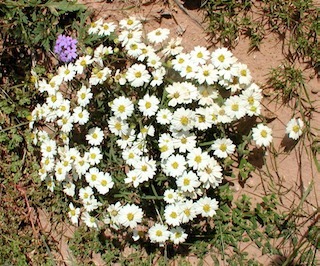 Blackfoot daisies have 8-10 outer white ray flowers on each head. A single ray flower has a broad petal with a notched end and a much smaller female pistil. When pollinated, relatively large black seeds will develop in the base of each ray flower; hence the name blackfoot. Dozens of yellow disk flowers form the center of the head and release pollen from male stamens. Pistils are also present on the disk flowers, but they are sterile and therefore do not develop seeds. Although my searching did not turn up any references to uses of this plant by Native Americans, I have to surmise that these compact rounded plants with abundant perky flowers must have been plucked out of the ground whole for use as a readymade bouquet by many folks over the years. And individual flowers on long stalks certainly would lend themselves to be woven into hair, headdresses, or other decorative items. 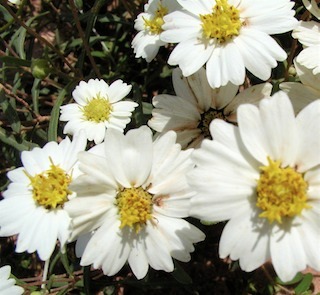 Fortunately one does not have to pick the flowers or pull up the plant to appreciate the blackfoot daisy’s jovial nature as it makes an effective border decoration in any native plant garden and is most effective in rock gardens. At the very least it smiles joyfully to all who happen upon it in the wild, so be sure to be on watch for this merry friend on your summer strolls through the Preserve. A pdf of this essay is available here.